The sparkling waters of the Cherai are a breathtaking confluence of lakes, lagoons and canals. Nestling between an idyllic beach and a lagoon, the resort is a magical destination for anyone looking for more than just a holiday on a calendar. That�s the place to go if you�re looking for nature�s green carpet as a setting and the calming therapeutics of Kerala�s backwaters. On the TripAdvisor website, 82% ranked this resort at #2 of 4 hotels in Cherai Beach. For our Q&A of the month, we meet four young professionals who drove down to Cherai Beach and found the experience rejuvenating. We talk to hotelier Shashank Shetty from Kolhapur, chartered accountant Nischith Shetty from Dubai, Ulhaas Joseph who is a business analyst in Bangalore and Philip Joseph who works in the travel industry. These are old friends who got together after a long time and decided to catch up on their worlds at a setting that allowed them to do just that. Over to these young professionals on their experience at one of Mahindra�s most popular resorts in the south. Q: Tell us about your first impressions of Club Mahindra Cherai Beach - what moments did you bring back? A: What greets you first is the grand entrance lobby at the resort and the reception area. As you set foot here you enter into a trance that takes you to another world - making you feel very, very welcome. The cottages at Club Mahindra Cherai Beach have a delightful old-world charm about them - traditional in terms of visual appeal, but with modern comforts and facilities. It’s useful to pick a room that overlooks the backwaters for an unmatched visual treat right through the day. The one-bedroom units here are stand-alone cottages with excellent facilities and access to a private outdoor jacuzzi. 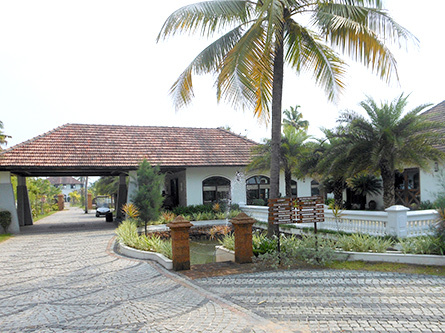 A: Club Mahindra Cherai Beach serves up authentic fare from Kerala fare as a main attraction. You also have Continental and North Indian to complete the resort’s multi-cuisine offerings, for a wider palate. We must add here that this is one place where vegetarians are not left in the lurch. The chefs were friendly and took extra trouble to make sure we were satisfied. And yes, the breakfast was invariably a big draw – nice to start the day with a sumptuous meal. Q: What about other facilities and activities at Club Mahindra Cherai Beach? A: The pool was a favorite hangout place for us – nice to soak in and blend into a holiday setting. The spa experience at Club Mahindra Cherai Beach was also relaxing and rejuvenating. We tried a traditional Kerala massage and found it most invigorating – just right to ease the aches, pains and stress points of city life. In and around the resort, you will find plenty to see and lots to do. A leisurely boat ride in the backwaters is something we want to do again – almost like time slowing down to the pace of your boat, gently gliding down calm waters. A: We must say that we were looked after very well during our stay at Club Mahindra Cherai Beach. No complaints, whatsoever. The support staff here is helpful and courteous to the point of pampering and spoiling you. They always give you personalized attention – ever smiling and anticipating your every wish. We found that they would go to great lengths to make your feel comfortable - often looking into the smallest details that can delight any guest at the resort. This indeed is a shining example of the standards set by Mahindra on hospitality. Q: Did you manage to visit any other tourist attractions nearby? A: We couldn’t do that this time, but we plan to get together again with the same bunch of friends and come back to Club Mahindra Cherai Beach. We so much wanted to check out Lake Poyil, which is small small detour you can take from the main beach. We met some guests at the resort who went on a pedal-pushing boat ride at the lake and found it most enjoyable. But we did manage to trek down to the paddy fields nearby. The lush green fields are exclusive paddy belts that are uniquely below sea level in a setting that works wonders for the crop. When we come back we also want to explore some legendary forts built by the Portuguese in the early 1500s. We were told that these forts are well preserved and give tourists a window into a world that changed the course of history, in South India.